Prompt and courteous service. Low sale pressure. Friendly service, very thorough, reasonable price. The employees are very entertaining and work great as a team !!! I don’t like that I’m not allowed to use the waiting room any more. Was more relaxing than sitting in my car listening to all the clatter about me. Loved staying in the car while the oil change and serpentine belt were done. Been a customer in New Milford CT over 10 yrs never had a problem. The staff was friendly, polite & knowledgeable. A great experience & I will definitely use & recommend again! Staff was knowledgeable, friendly and worked efficiently. This is a well managed facility. I am continuously impressed by the level of professional service. The staff is great and everyone works as a team. very informative and calm, collected staff. The staff was very courteous and efficient. Everyone was incredibly nice, fast, and very knowledgeable. I have been a costumer of theirs for a few years now and I wouldn't go anywhere else! Above and beyond service. Towed by car to the location and had a belt replaced. Belt in stock did not fit so Sarah drove me to the nearest supply store. Very helpful. I thought it was a little overpriced for an oil change. The person helping me was very kind and understanding about my discomfort from driving into the bay. The entire staff could not have been more professional or thoughtful. The staff was extremely efficient and friendly. The New Milford crew always does a great job. It was an easy experience that resolved issues with my vehicle in a timely matter. Telling me I need a license plate light bulb. Seriously? Love this place! Team is nice & friendly. No upselling. And they like my ride. Pleasant staff, no pressure, quick service. Jesus and the whole team were so fantastic! I took one of my older vehicles there for a basic oil change but plan on coming in with my newer car that I usually take to the dealership! I was absolutely thrilled with the fast and thorough service! The drive through and not having to get out of my car is AWESOME! Friendly, informative, knowledgeable staff. Operate like a nascar pit crew!Fast,Precise quality! Well informed, polite and highly efficient staff. Very nice people and very knowledgeable and answered every question and explained everything. Sooooo good! Excellent service, will return for my next oil change. I love that women are now working at Valvoline. I appreciate their attention to detail. The person who took care of most of the service explained everything she was doing and made me feel comfortable. I was impressed with the level of customer service I received, and I would definitely return the next time I need an oil change or any other service you offer. I was able to wait in the car. They were professional friendly and knowledgeable. And it was quicker than in the past. Loved that we stayed in the truck... seemed faster and more efficient. Best service ever... Fast, thorough, expert level of professional courtesy. In a class all by itself there is no comparison to any other. Familiarity with the truck. Crew did a great job on it. Very friendly. Overall I had a good experience. I would not return because an oil change at my dealership is cheaper than Valvoline. I thought the cost was too high. It was everything I expected, done quickly on a busy day, and done very well by nice people. I applaud you for hiring women to do this work as well. I have seen the women working there my past two visits and and she worked on my truck the first time. I like the changes you have made. Much quicker and more efficient. I used you for both of my vehicles. A Ford Explorer and Mercedes Benz. I had a problem with the Mercedes that your employees pointed out to me and explained what we could do to fix the problem. Without any pressure, I authorized them to do a oil flush and was pleased with the results. I am happier with the caliber of the new faces I see a Valvoline. They were polite, efficient and knowledgeable. Thank you for the changes. You will see me again. Frank and the entire staff were very friendly and helpful. They walked me through the whole process and were very informative. I didn't like that I had to wait in my car while service was being performed. Although the fumes were minimal, I didn't like that I had to be exposed to them. I would like to have waited in the customer area. Jenna was great. What a delightful young lady. It was time efficient and i felt that the service was perfect. Great service. The attendant was professional and friendly. She answered my questions and took great care to provide me with quick service. Jesus was very helpful and informative. He made sure I understood everything before I made my decisions. Everyone involved were very friendly. Technicians were friendly, knowledgeable and courteous. Professional service from the greeting to the finishing with a thanks and goodbye. The crew was great! Everything was explained and taken care of. I will return. Everything was very quick and easy. The staff seemed knowledgeable and was very friendly. I like the it because I didn’t have to get out of my car. That day was a really cold day. All the people who work there are friendly. They explain everything and show me what they were doing. Jesus who was in charge with my car was kind and answered all my questions and explained me what else my car needs to be fix. Definitely I will go back. I like the new change that this facility is a customer drive through service. Even though I had to wait outside before pulling is it was not long. I was happy with the service and total amount of time arriving, service and leaving. I use the same oil change facility every couple of months because it's quick and I can trust them to do a good job. I feel the price for your air filters are blown away out of proportion. A $10 filter and 5 minute job does not equate to $40 in my opinion . The person helping me (Matt or Mike, I believe) was very friendly. He even went the extra mile to hook up my car to the diagnostic computer to tell me why my engine light was on and wrote down the code for me. He explained everything he was doing very thoroughly. Very friendly and very knowledgeable. Looked over everything including blinkers, lights, tires & fluied. Emailed link to my receipt does not work. Hi liked the fact that I sat in the vehicle and I could see everything that was being done to my vehicle. I've never been to a drive-thru oil change before, so I was amazed at the quickness, efficiency, knowledgeability and friendliness of the staff. They guided me through the whole process, told me the status of my car, recommended services and did not make me feel pressured at all. I was impressed by the fact that they were showing me the computer screen as they were working through the charges so that I knew exactly what I was paying for. My boyfriend was there with me and now he's excited to bring his own car to the Valvoline near his house. I arrived and was instantly guided into the service bay, greeted in a kindly manner and proceeded to get serviced, the technicians that were working on my car yes plural. Atleast 3 people were working on my car at once, i wasnt being sold anything extra but once i asked they kindly answered in a very knowledgeable and professional way. The service was beyond what i expected to be honest and it was definitely almost instant. I shower up and told me to pull right in. They let me know my options and the benefits to each. Very quick, very friendly. I had nice friendly conversations with several people. Great service provided here in New Milford ! Thank you! Work was performed quickly with a group of friendly and professional techs. I liked the convenience of being able to get my oil changed and tired rotated in one visit with no appointment. i think his name was frank, he was the manager at the new milford location i believe? anyways he was super sweet and helpful. I did complain about a problem once. Had one call from you guys saying it would be taken care of and that was it. Never heard back from your front office again. Once a competitor comes along, I will try them out. It’s really that simple, you ask if I / we have any problems. I / we say yes, you spoke with me, and never followed up. Lousy customer service, sadly not from front line staff, but from corporate! Excellent customer service. It was quick, efficient and they did not try to sell me stuff I don’t need. Staff was friendly and knowledgeable. The assistant manager knew exactly how to reset my oil change light. I LOVE that you hire both men and women. You have a diverse work team iun New Milford, CT and, I feel they talk to me with honesty. Very professional, friendly, kind. 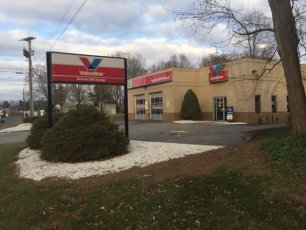 I've already recommended New Milford, CT Valvoline to a few friends. Excellent job! Staff is always very friendly and professional. They are quick and I have recommended them to others. The service techs at the New Milford, CT location were incredibly friendly, knowledgeable and helpful during my last visit. I honestly was so impressed, which I never expected for an oil change. Whatever the company is doing for personnel hiring and training, keep it up! Many other businesses could learn a thing or two, your staff is truly professional. I also had an oil change in May 2018 in the Danbury, CT white street location, and was impressed by the service, friendliness and knowledge of the staff there too. I will be a customer for life! Two things: 1. At first I thought it was weird that I was asked to stay in my car, but the minute I thought of it from a business model perspective it made sense to me. Also, as a customer I like interfacing with the employees. It makes sense to me now.2. I love that you hire women as well as men. Women are a little more detail oriented and so it raises the trust level. This is not a slight against the male workers. It is just a nod that your organization is not sexist, and that it is forward thinking.One final note: The workers at your new Milford location are amazingly friendly, especially Sarah. She got me to pull the trigger on doing the air filter. I never would have, but she had me at "It won't take any longer". She's a keeper. trust me when I say this: That location is making a ton of money directly from her efforts. Good job training her! All techs were super friendly and efficient. It is nice to see everyone working as a team to get the job done fast and right. My husband and I love our New Milford Ct Valvoline! We won't go anywhere else! There was a frenzy of employees working on 3 other cars at same time. Three employees each came over at different times and opened my door to check tire pressure rating but no one actually checked my tire pressure on my tires. Too many people working on different vehicles at same time, things will be missed. No one even talked about other 'upsell' items. As I have already noted, the service, the friendliness was as good as it could be.I would just like to add that I wish they had checked the oil before changing it, because it turned out that the warning light I saw, was not about the need for an oil change, but a possible malfunction warning light. I know this because the light did not go out after the oil change. Not being familiar with the car, I didn't realize this.After looking through the manual, I found the light is most likely a malfunction warning light, which means it has to go to the dealer. I do not blame the people working there, they assumed I needed an oil change because I said so. But it would have been a good idea to have checked the oil. Ease of getting service done,love being able to remain in car. I am disabled and this makes It a breeze. The staff explained everything they were doing before, during, and after they were doing it in language that I could understand as a “non-mechanical” person. They showed me my c02 filter (which I knew needed attention from a mouse nest) and my cabin filter. They were able to give me pricing in real time. They were kind and calm yet motivated and quick. I didn’t feel pressured into any of the additional purchases I made. I purchased new windshield wipers, a new cabin filter, and new c02 filter (I was told it needed to be done at my last service with Subaru, but the staff showing me at valvoline helped me to understand and make the purchase). Stay this way! The extra charge for more than 5 quarts of oil is my issue. If I needed less than 5 quarts would you refund the difference? The technician was VERY clear about the charges but at that point there was little I could do since I was sitting in a car with no oil in it. The staff was excellent and the service very quick so from that standpoint I was satisfied. Corporate pricing systems should be reviewed because it leaves customers feeling a bit "over charged"
The staff was extremely well organized, professional, courteous, knowledgeable, and just plain happy in their work. The most professional, friendly group! The promotion of the young female to Assistant Manager was well deserved. The atmosphere now is more appealing because it is so well run, more friendly, professional and competent. I am sure female customers will welcome the improved atmosphere. I am a 57 year old male and have been a customer for many years. This is best version of Valvoline Instant Oil Change New Milford to date! My experience at New Milford, CT's valvoline was amazing. I received amazing customer service from Frank, Elando, and Javier. It was quick, clean, and exactly what I needed. I will definitely recommend this valvoline to friends and family. I was in and out, they did not try to sell me something that i did not need. The people working were very nice and helpful. The manager didn't pressure me to spend more money which is what I had experienced at valvaline in the past. In fact, he saved me money but letting me know a synthetic blend would also work with my car. I have already reccomended this valvoline to my family. The staff was friendly and informed me of everything that were doing and recommendations for other repairs. FRANK, THE MANAGER PROVIDED ME WITH EXCELLENT CUSTOMER SERVICE TO CHRISTOPHER. The woman that helped us, Sarah and her team were so helpful, quick and kind. My children also had questions that she very kindly answered. It was a great experience overal! I would recommend this particular Valvoline to friends and family! Very impressed! I went in for a radiator flush and fill. The fluid was low and I suspected a leak in the system. The tech told me that if I had a leak I would be better off going to a full service mechanic that could make repairs. We examined the "wet" spots on the engine and discussed the type of fluid that could leave those spots and my thought was it was oil and not radiator fluid. I decided that the speed of service was worth the risk of having to do it all over again elsewhere it I was wrong. As it turns out there was no leak and the tech told me that the system held pressure throughout the procedure. I felt fully informed about the service before doing it and at the end felt like a winner. I always make Valvoline my first stop when I need a service that Valvoline provides. I use the same service center most of the time because relationships mean a lot to me and I like being recognized as a regular customer. No longer a waiting room service. Stay in vehicle and self drive thru. Everyone was polite and I like the in car experience much more. The staff that worked on my car we’re so pleasant and friendly. I appreciated their interaction very much. They did not pressure me into anything which also made me feel comfortable. great service manager was on top of his game. The technicians were very knowledgeable and they explained everything. It took 15 minutes in and out cars oil changed and the air filter was replaced. Very satisfied. Great crew, great service, friendly informative, quick , no sales pressure.Will be back! people friendly no wait time very honest. Every time my husband or I Rae our cars to get an oil change, we drive out of our way by miles to come to this location. The staff is always so friendly and prompt and I truly feel like they all go above and beyond to make us feel comfortable. It seems like they all have smiles on their faces each time and really enjoy their job. Sorry I don’t remember there names, but they are so courteous and professional and very fast. Been going there for years and will continue every 3,000 miles. Great service !!! The staff was friendly, efficient and explained everything they were doing clearly and in a way I could understand it. Used to paying around $100 to $110 for my previous ford excursion diesel which took 2 qts more, so was astounded to pay nearly $180.00 for an oil change. The service was performed quickly and courteously. Staff went above and beyond to complete the fluid exchange. The members of the staff were courteous and helpful. At this particular location in New Milford, CT, there was a drive through oil change with no wait time. All costs were explained and itemized. Staff were professional, extremely curtious and knowledgeable. everyone was awesome...will be bringing my car back for sure!! Quick and easy service and very knowledgeable employees. I have been going to this location for over 4 years - we have 3 cars. The ease and no wait even when busy is excellent. I have to say I do like the drive through service now and the current staff is very efficient. Thank you... I continue to recommend vavoline. waiting in the car is bs. I like the comfort of the waiting room. i'll be looking somewhere else that has a waiting room. The service was awesome; the people working were friendly, professional and efficient. Great service. Very attentive. Great job. Efficiency. Economy. Expertise. Wait. Maybe I should trademark that. Staff is friendly and professional; quick service. Informed but not pressured by team to purchase additional services. Overall great experience! The guys were efficient, worked well as a team, informative. Very knowledgable and friendly staff. Staff is always friendly and professional. They offer additional services but never make me feel like I have to purchase. I truly trust this location staff. All the staff was very nice but I found the woman who interfaced with me to be knowledgeable, courteous and trustworthy. I also felt that it was great to have women in this make-oriented role. Bravo! Everyone should learn how to work on cars. 88 dollars for an oil change come on really? I have been taken my families 6 cars routinely for the past 10 years to our local Valvoline. You have priced us out sorry. I cannot pay 88 dollars for a subcompact car oil change when nearby competitors can due it for 24.99 for the higher grade oil than Valvoline. I, my family, neighbors who I speak, the kids sports teams families, and others with will now be going elsewhere. I was very satisfied with my visit. The employees were very professional and explained everything they were doing. I definitely would go back again in the future. Great, fast service, no pressure, no hassles. In the past you would drop your car by the door and go into waiting room. When car was done and pulled out you would pay and leave. I really do not like sitting in the car while they are working on it. FRANK HAS ALWAYS PROVIDED ME WITH EXCELLENT CUSTOMER SERVICE. Very good management and great staff! Frank - Store Manager is very friendly and makes you feel right at home. He manages his crew of people very effectively in order to service his customers in an expeditious manner. My handicapped Aunt was with me and not getting out of the car was great! Mgr. seemed bothered I declined synthetic oil. Said it was recommended, which I acknowledged, but I stated owner's manual said syn was not required. Frank and crew are great! The service technicians were friendly and fast! As always, guys were pleasant and got right to work. I had additional issues with my cat,tbat turned out to be a battery issue and it was immediately replaced. Costs were reasonable and staff were efficient as usual.Very glad that month after month the same staff are there and I'm recognised! I called as a last minute option to see if I could get 4 tires at a good price. Mike was very helpful and even though it was late in the day they said to come on in!Service was quick! Stay in car very good idea. The service, and the help, was very good fast and friendly. Wasn’t crazy about sitting in my car while my oil was being changed. Would have preferred the waiting room. First time doing a 'drive thru' type of service with it. Mgr FRank CRuz provides excellent service. The manager was outstanding. I think his name was Frank. The service people were so nice! I did what they recommended because they explained why but next time I hope to jut change the oil! I was impressed by not having to leave my car, the friendly, knowledgeable staff, and the speed of the service. I loved the drive thru service and that I never had to get out of the car while they changed my oil. I think I was done in 15 minutes which is great for me as my time is usually at a premium All the staff was very courteous, especially the store manager, Nick. They met me immediately upon arrival. I was in and out more quickly than I had expected. And they saved me a trip to the parts store for wiper blades. I always get great service at the Valvoline in town. They've been nothing but polite, efficient, and friendly every time I visit. The employees were really nice guys who seemed to enjoy their job. I have been telling everyone how great my experience was. very professional and explain everything. I will be going back. Sarah did an amazing job walking me through the services being provided to me. She was competent, professional and engaging. Always push for additional parts to be replaced. Total car care, in about 20 minutes!Most Excellent!! They've recently changed their workflow and the experience is even better. The staff was trustworthy and let me know exactly what was going on, very helpful, great work! Due to a recent "company decision" customers now have to drive their vehicle into the bay. This was different and not the routine where representative drives vehicle into shop. The big open pit and fear of wrong turn is an apprehensive feeling that I did not like. However, it was nice that i got to stay in my own vehicle until service was complete. Recommended intervals - 3500 for standard oil is very dated and, not supported by OEMs. I choose synth blend not based on 5k recommendation but my own knowledge/experience. I think your intervals are misleading and perhaps over-lawyered. The staff there was absolutely amazing! They were very enthusiastic and explained everything. I would recommend this valvoline to anyone and everyone. All my future oil changes will be done by you guys! I was pleasantly surprised staying with my vehicle during the visit. Very professional team. I observed a worker instructing a new hire. Very precise communication. I learned just listening. I am a UPS driver and I enjoy and appreciate professionalism whenever I purchase a service. Hats off to the crew in New Milford. Thank you! The service was fast and they knew what they were doing. I didn't appreciate having the label put into my vehicle saying that I needed an oil change in 3000 miles because my car goes at least 6500 miles before it needs an oil change. So I asked them not to put in the label. The manager & asst. manager both greeted me and explained everything that was going to occur and were both friendly and professional - not always an easy task! When I arrived, they said there is a new drive through experience. This was awful. I had to sit in my car in the garage in the heat. It was such a bad experience that I will not go back to Valvoline. I want to wait in the waiting room in the air conditioning outside of the garage. I will go elsewhere and pay more to get my oil changed. I wish I remembered this gentleman’s name who serviced my car, but he was very kind l. I did not have to wait at all before pulling in. I also love the new system where you don’t even have to leave your car. Such a bonus! Especially with kids! I needed a top off 1/2 qt of oil I was charged. I occassionallly use Valvolne ( not convenient in my area) but my friend who was with me always does. I did use Valvoline when I lived in 06825. The tech was very good and the manger was great and worked well with his team. Manager and staff were great. It was INSANELY expensive for just an oil change. The staff was great but just shy of $100 for an oil change is ridiculous, when Mobil 1 retail price for 5 qts is $22. I thought it was weird/awkward that they had me drive my car into the garage and stay in the car during the whole oil change. They said it’s a “new policy”. I don’t know if I’ll come back for that reason. New way of doing the oil change. New process. Don’t have to leave my car. Great staff very professional fast and efficient although I thought the oil change a bit pricey! The service at this facility is amazing. The staff are so polite and helpful!! Staff is friendly, fast, and knowledgeable. You can tell they work well together. No pressure and no patronizing - truly an enjoyable experience. Competent, friendly staff. Sarah was great - but the team interaction impressed me. You've got a good thing going here in New Milford. It was my first time to get the oil changed since the drive-through service began and I think that's so much better than getting out of the car and sitting in the waiting room. It's been a long time since I've been to a Valvoline (7 or 8 years maybe?). Last time, I felt like I was baited in with a coupon and then literally harassed by high-pressure upselling tactics at ridiculous prices. I was reluctant to go back, but I needed a change on short notice for an unexpected long trip. VERY pleasantly surprised by the experience, which was 180 degrees from previous. Very friendly, fast, drive-through, complete. I will most definitely be back. Well done, Valvoline brand team. I suspect you received some complaints about the old business model and turned it around brilliantly. Well done. I was greeted promptly.....I had a very short wait and didn't have to get out of my car. The gentlemen who serviced my vehicle were very pleasant, they worked but we chatted about what he was doing and how things were going. It was an enjoyable experience.....I've always been pleased with the service I have received at this valvoline. Frank the customer service manager was very professional and explained all of the details of work that they were doing. The people were great. Now it’s a drive though no waiting room. Service was even faster than before. Guys are great. Excellent service from young lady. Very knowledgeable. A great staff that remembers me and treats me as a valued customer. Their knowledge, and dedication along with the speed of the service is just what I need. I trust the staff at this location implicitly. Excellent service by staff, however, the waiting room was closed and it was a very hot and humid day waiting in my car. The technicians seemed distracted by an error they had made on the car in the next bay. All attention was then focused there and we were left to sit and wonder when our service would be complete. When they finally returned there was a lot of discussion among them about who checked the tires, the battery, etc. We have no idea if the filters and belts were ever checked. After a long time sitting in the car and waiting we were just glad to get back on the road. The people were courteous and kept me apprised of what was happening. Very nice! I do not care for the policy change that now requires the customer to stay in their vehicle. As I understand it, this change was made in the name of expediency, and while I appreciate the need for speed, I am concerned that focusing strongly upon rapidity may make quality a secondary factor, that employees will become driven to do their job too quickly, and to overlook potential problems in order to keep the line moving at the desired rate.I'm glad to have the work on my vehicle done in a timely manner. but it is far more important to me that the mechanics have the time and inclination to do the best job that they can. I'm dubious that this will be possible if they are constantly racing against a stopwatch. Sitting in the waiting room quietly reading a book or magazine was part of the joy, the comfortable pacing of having my vehicle serviced...a pleasant break in my own oft hectic day. I was sad to see it replaced with a footrace. Staff members were courteous and explained specifically the services. Having to sit in the car in the heat is a terrible idea, i won't be back in the summer months for sure. All of the employees were extremely helpful and courteous. Very professional. The Manager, Frank, is always so helpful. Both technicians, Austin and, I am sorry I can't remember the other technician's name, were both so polite. I appreciate that they are all so professional and don't try to pressure me into anything. I recommend this location to everyone. Please let them know that know how great I think they are! The attendants were working during an extreme heat wave yet were super friendly and upbeat. Their professionalism and friendliness will keep me coming back to this specific location. Although the new sitting in your car during the service procedure is okay, it was hot and I would not do it again on an extremely hot day. Very quick service. The rep explained the parts that could be changed and the selection of oils with pricing. Everyone very courteous and helpful. I would definitely go back. The staff was exceptionally friendly and made me feel very welcomed. The service was completed quickly and I was asked questions to make sure I knew everything that was happening. I was recommended additional services, but not in a way that made me feel uncomfortable if I declined them. I was extremely pleased with the service and speed of much visit. The employees were so friendly, patient, and thorough. I told everyone I saw that day about how awesome my experience was with valvoline. Once again the guys came thru, they were fast and efficient and knew exactly what I needed. Both the Tech and the Manager on duty explained things to me in an easy way to understand and got right to it even though they were busy! I had an additional program in the way of an A/C drain plug issue which Frank identified and fixed. The staff is friendly and the experience is always pleasant. I had a check engine light on in which the location manager diagnosed and told me which oxygen sensor to replace. As a result I managed pass emissions. The professionalism of Sarah and Justin was superbed the notified me of an engine oil leak, transmission leak, and air conditions belt that is not installed. This has been the most professional Valvoline I ever set foot in. Great crew. I was in and out very quickly. Car was taken immediately and crew hopped right on it to finish the job. From the moment we pulled in, the staff was full of smiles and super friendly and courteous. I’ve never been to any other service center where the staff was so nice. It’s only been a few days since I had my oil changed and I’ve already recommended three friends go there. The people were all very friendly, helpful and not at all pushy about adding things on. Thanks! I like the service I received in New Milford but when my engine oil light came on and I needed a quart of oil the Danbury manager on white street wanted to sell me oil.i was always going to jiffy lube with my 3 cars I think I will be going back. Price! Even with a coupon the bill was about $30.00. It would have been almost $40 without a coupon. I think that's a bit much for 4 quarts of oil and a filter. I think pricing is a little bit high and honestly in all the times I have been there with all different cars there is NEVER a time where it just takes the amount of oil covered under price, it ALWAYS takes more that I have to pay more for. The Manager on duty is always very professional and helpful. I think he holds the other employees to a higher standard. The service is so fast! Also they give me details about the recommendations so that I can make a more informed decisions about my service. Even though I pulled in at a busy time, I still got immediate attention and waited a reasonable amount of time. The friendly and low pressure staff provided me with confidence in their products. This location in particular is the better one that I have been to. Other Valvoline locations have not provided the best customer service. Original price quoted did not include the "extra" $19.99 for the :special oil filter". This is more than the retail cost of a premium oil filter elsewhere, and it was not discussed at all when the service was originally quoted. Nor was the additional quart of oil discussed. The initial price quoted was $129.99, which ultimately ballooned to $168.85. When service is quoted *after* the operator has scanned the vehicle information and it has been entered into the system, the price quoted should match exactly the bottom line cost. Anything else is a deceptive practice. No pressure to do extra services! They were very friendly, took us quickly, and was done quickly. Workers extremely polite, quite noticeable. All very knowledgeable. Very patient and explained in detail what will and what was done to the car. ; also recommendations for future visits. I continue to use Valvoline and the staff is always friendly and helpful. I watched the front desk person discuss additional services with another customer and she was very clear, friendly, and patient as she explained the details. Excellent teamwork and leadership at this location. They had on their computer what type of oil and additive I use in this truck. Everyone seemed to be knowledgeable, friendly, helpful, and professional. Service was great and manager is great. They were very good & pleasant. The staff was friendly. It was very busy but i did not have to wait long. I was well informed of the additional service needed on my car but I did not feel pressured to have it done that day. This is only my second time visitng this location. I came back because I was able to do this on my lunch hour and they were SO friendly before, I just had to come back.Someone at work had recommended you guys to me back the first time. I arrived a minute after closing and Javier insisted it was not an issue and that they would be happy to help. The entire staff was extremely courteous and knowledgeable. It was a seamless experience! I will be back for sure! The staff was friendly and courteous, the facility was clean, and I was in and out in about 35 min. The staff was awesome. I went to a express lube once and say a tech spray a filter than come to me and tell me I needed new one.The manager made me feel confident about them and I ended up very happy. I don't write reviews but felt they needed to be thanked. It was okay. Average. They are always polite and I so far I haven’t had a problem. I was highly satisfied as service was provided as promised and expectecated by staff member and providors. The staff at the Branch are outstanding, kudos to them! I had my one year old with me and your sales person on duty interacted with him and was very personable. The service was quick and I was in and out in about 20 minutes. Guys are always great! I'm in almost monthly and it's nice to see the same faces! And they remember what I look for from the last visit.Definetly a plus for me! I thought the pricing for my cabin filter was double what I paid last year. They brought my car in promptly. The store Manager (Frank?) was very friendly and helpful. Made the process a breeze. The service manager. Frank Cruz Jr was extremely polite took the time to explain all to me. I am a 63 year old woman who knows nothing about car care.I am in New Milford to be with my son who is undergoing a 4th open heart surgery I live in Georgia my son always took care of my car for me. I will be using Valvoline near me in the future because of the experience I had. This manager is is great I hope they all are like him. Ramon was very nice and helpful. It was quick and easy and the staff were very knowledgeable and informative. Ramon was really professional and helped me get my oil changed without any issues, he was great!! i always feel pressured to buy filters or a service at the other places. the manager here is great showed me my filters and told me if you want we have it if not no big deal..
Frank the manager at the time of visit was very professional, courteous, sincere and not at all pushy to upsell. He’s awesome and I hope you all keep a person like that around! The tech was friendly and helpful. I did not feel pressured to have additional services and all costs were explained. My wait time was short and the waiting area was clean and comfortable. Pricing and options were made available to me, and customer service completely understood what needed to be done and had given me options for my next visit. i have no complain people that work their are very nice. The staff is friendly and upbeat. The manager is especially pleasant and knowledgeable. All of my questions were answered and I did not feel pressured to purchase additional services, but rather educated on what different services do for my car. My overall experience was excellent and I will return to this service center for future maintenance. Got me in and out pretty fast despite the store being somewhat busy. The staff was beyond friendly, my service was only 16 minutes which worked out in my favor with having to head to NYC unexpectedly. They topped off all my fluids and also changed out my filters. I will be going back my next oil change! Love going to this Valvoline. The staff there is amazing! Very knowledgeable, respectful, and funny! Definitely definitely recommend this valvoline to everyone! It was easy and the staff was very friendly. Great price, great staff, fast service. I will definitely be back in 15,000 miles or so. They perform up to expectations without any problems or pressure to buy services. Quick in and out. The prices were 3 times the amount that of the DEALERSHIP!!! Also I was not told how much it would be until after service had started. RIDICULOUS that an oil change was 96 dollars!!!!!!!!!!!!!!!!!!!!!! Frank is a great person to work with. He knows his regular customers and what I expect. I also observe him interacting with other customers and he always reflects their level of need in his service and interaction. All employees were friendly and knowledgeable, there were several cars ahead of me, but my wait was not terribly long, and employees advised me throughout the visit on when the oil change would be completed. Both the Service Co-ordinator and the technician were very polite and answered all of my questions. Everyone was friendly, smiling and professional. The facility was clean and comfortable. I was in and out quickly, without feeling rushed. Great experience! The staff was friendly and informative and got the job done quickly. The manager that took care of me was very professional and courteous. This was yesterday, Saturday, March 3,2018. I believe his name is Eric? Plesant visit. Thank you. Everything was explained, service quick, manager & staff were very good. Staff was very friendly and explained everything great. I thought the best part of the experience was the employees being such courteous people. All the staff is very friendly and seems to know their job. I liked that you have a woman working at the front desk! Very well run shop. All staff went above and beyond. I have been going to this valvoline for several years with various vehicles I have owned. The staff have always been very good to me. They keep me posted on what is due for my vehicle maintence and what I can hold off on. They give great advice for my vehicles on their value and what to expect to get if I were to sell them. They are aware of what a customer can afford and are very respectful, they do not push any extra service unless it is absolutely needed. Your Manager and person behind the desk were very courteous & knowledgeable. I'll be back. Team was friendly, professional, and quick. Manager kept things moving along and was very informative and helpful. Always rises to my expectations! Previous visit an part order was needed and the staff followed thru so it was available this time for me as promised! Great customer service every time! No specific reason why I would be HIGHLY SATISFIED; but there is no specific reason why not. There was an additional charge over and above the listed price for my service which reduced the coupon that I had. I was disappointed about that. Professional staff; clean work area and waiting room; no upsell pressure. I stopped in at this Valvoline building and was very appreciative of the way I was treated by the workers, they were friendly and courteous. Unfortunately I didn't have enough money for a tip for these because I just came from the grocery store. I would have if I had it. I will definitely tell other people of my experience! Really like this particular location. They were friendly knowledgeable and quick. I have been happy with the service from my very first visit and have been a customer for a number of years. I like the professionalism and speed of service and my impromptu ability to just pull in not needing an appointment. Service was prompt and personnel polite. I've been going to Valvoline for years, but it was my first time using this location because I just moved to the area. Service was fast and the staff was friendly and helpful. I liked that additional maintenance was mentioned to me to be aware of but the staff does not pressure you to purchase more than what you came for. Also everyone was working to be prompt even though there were other customers ahead so that wait wasn't too long. The attendants are fast, curteous and knowledgeable. I would not think of going anywhere else for an oil change. Rick, the assistant manager, was very helpful and friendly. I’d go back because of him.